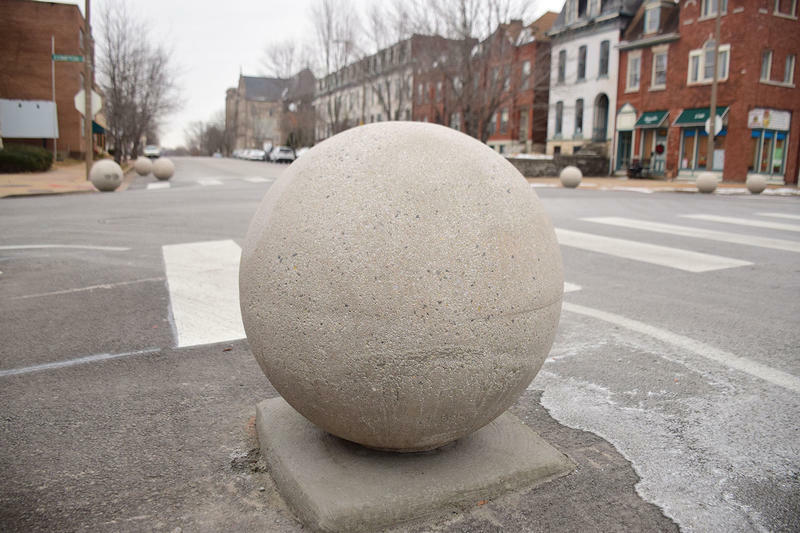 At intersections along Compton Avenue in south St. Louis, these balls now sit near street corners in the road, narrowing lanes. On Dec. 12, residents reported that a car struck one of the balls. The barrier broke off its post and rolled away, leaving a bare metal rod that was later covered with a warning barricade. A few days later, another resident photographed a large truck trying — and apparently failing — to make the newly tight turn through the intersection. At least one ball has large scuff marks. One resident watched as a truck driver repeatedly reversed and re-angled their vehicle to make the turn. 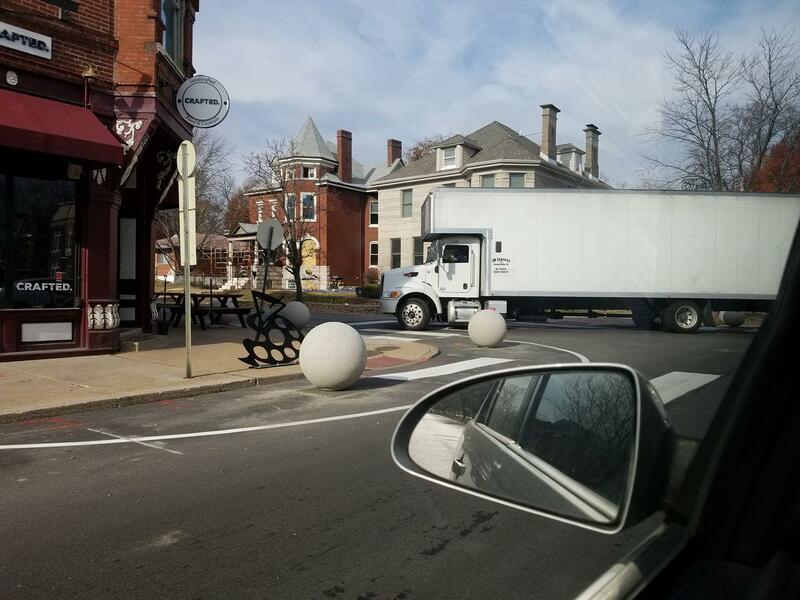 But hindering commercial trucks is one sign that the project might be meeting its goals, according to Alderwoman Christine Ingrassia, D-6th Ward, who’s responsible for the barriers. Ingrassia said the impetus to install the balls came from residents’ complaints that drivers along Compton Avenue skipped stop signs, and that outside traffic, such as trucks and commuters, were crossing onto Compton to avoid traffic along South Grand Boulevard. Ingrassia said that the barriers were designed in part to encourage that traffic to stay on Grand. The idea for using balls as a barrier comes from other cities that have used them for similar projects. The idea to narrow the lanes came from a $50,000 traffic study conducted in the ward by CBB Transportation Engineers. So through participatory budgeting, where residents could vote and weigh in, the alderwoman decided to put her ward’s $300,000 annual budget towards road improvements to slow drivers. 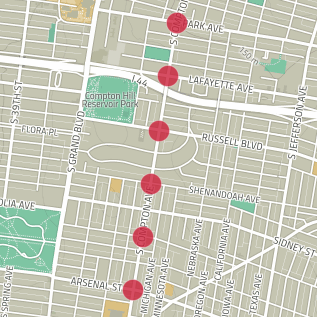 The concrete barriers will be installed at Park Avenue; they already stand at Lafayette, Shenandoah, Magnolia streets, Russell Boulevard, and Arsenal Street intersections along Compton. When she heard about Ingrassia’s plans to calm traffic, Fedio was excited; she said the alderwoman has done a lot of good work in the ward. But since the installation of the balls, Fedio hasn’t seen the changes that she’d hoped for. “It really doesn’t seem to calm the traffic of what we were complaining about — people running stop signs and going over the speed limit up and down Compton,” she said. From her home she’s both seen and heard cars skipping the stop signs and continuing to speed down the street. Instead, Fedio said she sees the balls slowing drivers as they turn onto the side streets — which does protect pedestrians, one of the goals of the project. But it also traps large vehicles that are supposed to be in the neighborhood, Fedio said. Large vehicles are part of Brandt Genz’s concern, too. As a neighborhood business owner who often drives along Compton, he finds the balls a little “obnoxious.” But as a former civil engineer, he’s even more confused — and worried — that the balls could spell trouble for emergency vehicles. Ingrassia said that the police and fire departments signed off on the plans for the intersection, and that the intersections abide by measures called for by the Institute of Traffic Engineers and the National Association of City Transportation Officials. But Genz said that he still worries about emergency vehicles making the tight turn successfully. For an emergency vehicle in a hurry, it’s much safer to run over a curb than to bash into a large ball. The balls could slow down the vehicles. Rather than cement spheres, Genz advocated for bump-outs — expanded curbs that are proven to slow traffic. Bump-outs were also one of the recommendations made by the ward traffic study. Ingrassia said that she considered bump-outs, but they turned out to be prohibitively expensive on a $300,000 budget. Bump-outs would cost as much per intersection as the entire six-intersection ball solution. So instead, she opted to paint the shape of bump-outs on the roads and install the balls inside those lines as an “aesthetically pleasing” option to narrow the lanes. Considering the limited budget, Genz noted that plastic, bolted-down lane dividers could potentially slow traffic more safely and more cheaply. Ingrassia said that the city will keep an eye on traffic patterns, and potentially consider applying for federal matching grants to upgrade the project. The city is still adding lines and finishing the intersections. If it does prove true that the balls don’t increase public safety, as some residents fear, and the traffic data doesn’t seem to improve, then Ingrassia said using balls may be reconsidered.